Local and foreign investment into our housing economy is a hugely positive reason for Toronto’s recent emergence as a world city. Toronto is no longer the boring backwater of the 1980’s, instead it is considered a vibrant, rich, world class city. It is much talked about around the world. This is Toronto’s day. Rail deck parks, 5-star hotels, new public buildings, dozens of new office buildings, new restaurants opening daily. This is a downtown buzzing with people 7 days a week. Our vibrancy has helped other nearby cities catch fire. Hamilton now has a great opportunity to rediscover itself, Toronto’s Brooklyn. Niagara Falls, Guelph, Barrie, St Catherines, Kitchener/Waterloo, are all experiencing outsized growth. Thank you very much to Toronto’s new development industry and foreign investors buying into new developments. We are the envy of every North American city. They want to know how we did it. Yet we conspire ways to destroy the very reason we got here. 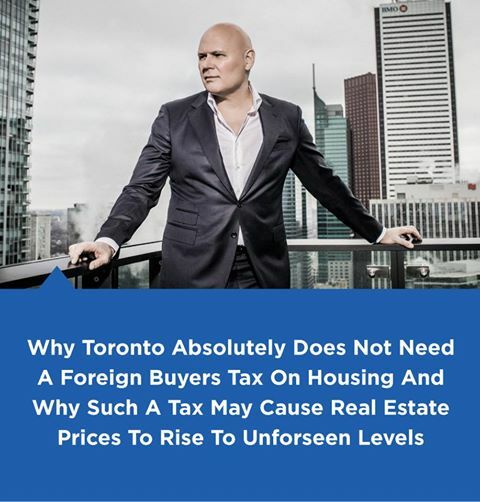 Vacancy taxes, decimating the OMB, foreign investor taxes, adding new rent controls, speculator taxes, all of these initiatives are wrongheaded and risk what we have achieved. We are an overtaxed people. We are the only city in North America with a double land transfer tax, one for the province and one for the city. Despite mistruths from the municipal government, property taxes are doubling every few years through higher assessments. New purchasers of condominiums pay massive levels of taxes and levies to the city of Toronto. Their fees are now up to $50,000 for a tiny one bedroom suite. Canadian investors are wildly overtaxed. Most real estate investors I know are not rich, they have just chosen real estate as an investment route instead of a security laden RRSP or investment account. We are now going to dictate to them when they can sell their investment property by creating additional punitive taxation? A “speculator’s” tax? What about home renovators who buy old homes, renovate, update, and then sell? Are they speculators too? I have been very vocal about a foreign investors tax. It is so wrong on so many levels. All it will accomplish is potentially shutting down our new development condominium industry. Who knows the repercussions of that. There is so much misinformation about thousands of vacant homes. This is an urban myth. Is a snowbird, a cottage owner, a developer with unsold inventory, someone with a pied à terre, or someone travelling for extended periods, a vacant use? These people will likely all be included in a vacancy tax when government gets involved. What are we doing here? The wild assumption that a house left vacant after closing is permanently vacant is false. No sane investor will keep a home vacant for a long period of time. If a home is unoccupied it is likely for a good reason. Perhaps it’s unoccupied because it’s awaiting renovation, rental, or demolition. All of these take time to initiate and accomplish. God forbid it’s someone’s second home. We can’t have that. If we create rent controls on properties built after 1991 we are just punishing those we want to help. If these properties are subject to the same rent controls as those built before 1991 investors won’t build any new purpose built rentals. How are we helping Toronto? Instead we will shrink new rental supplies. There is a hybrid compromise that is possible. I hope that common sense prevails. Finger pointing and bad ideas, the three levels of government are all just proposing vote saving expedient sound bites. None of which will solve the mess all three of these governments created. I have an idea, why don’t the three stakeholders in Toronto’s portlands (City of Toronto, Queens Park, and Ottawa) stop fighting and start building. 100,000 homes can be squeezed into the portlands. Re-staff the OMB, relax zoning restrictions, and build infrastructure. This is what will stop prices from escalating out of control.